I am constantly amazed by the traffic I get here. I average about 200 hits a day (a little less on the weekends). Some days, I get as many as 280 hits. I want to thank all my regulars for their contribution to my hit count. When I check my sitemeter, I get a picture of where my visitors come from, and which posts are attracting the most traffic. I don’t get it. This is not an “international” forum. Most of what I discuss would be meaningless to anyone outside of the US, or at least, North America. Some of it is just meaningless, period. 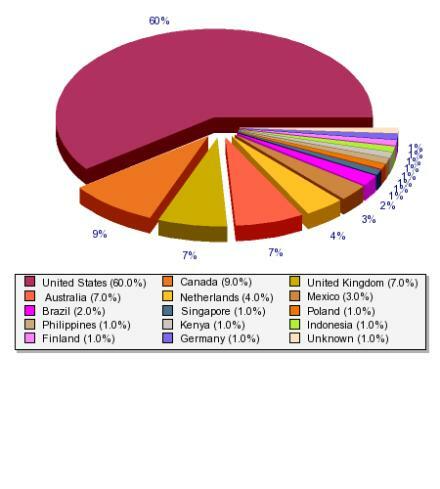 But as you can see, 40% of my traffic is from outside the U.S., and 31% from overseas. For whatever reason, the post about lead in lipstick is the number one, top ranking post of all time (well, of the 3+ years I’ve been blogging). There have been over nine thousand hits on that post since I put it up on October 30 of last year, 7-1/2 months ago. Why? The lipstick post is followed by one about my favorite sandwiches, one on toy nostalgia, and one on little-known facts about New Jersey. Huh? The Greensburg, KS tornado pictures get a good number of hits, even though it’s been more than a year since the storms, and the ‘Perfect Major” quiz has been popular since I put it up, getting at least one hit every day. I don’t get it either. I don’t get even close to your traffic, but the posts that keep “bringing them in” are surprising to me. The biggest draw is a post about replacing the heater motor in my pickup, of all things. Another post about my neighbor’s son’s pics of his harvest trip catches a lot of traffic. But, I’ll put up something I think might draw some comments and get bupkis, and something I tossed out in a hurry gets quite a few. I do know that most of my repeat traffic is from fellow bloggers. It is a fairly insular world we blog in. Jeffro, I think “fairly insular” is an understatement. The same people who comment here also comment on most of the blogs I read. It’s almost like we have our own little clique.